When it comes to martial arts cinema, one name stands above all others – Bruce Lee! 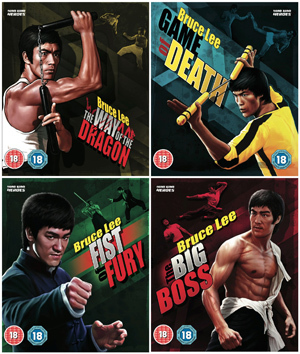 Now, four of his greatest films are coming to dual DVD & Blu-ray October 26th – The Big Boss, Fist of Fury, The Way of the Dragon and Game of Death – and we have copies to giveaway! All must-own landmarks in the martial arts cinema and integral to the legend of Bruce Lee. We have 1 Blu-ray & DVD Dual Format copies of The Big Boss, Fist of Fury, The Way of the Dragon and Game of Death give away! What was Bruce Lee’s last film?